THE WINDSOR FACTION is an alternate history fiction novel. In this book’s parallel universe Mrs Wallis Warfield Simpson dies in 1936, and therefore Edward VIII does not abdicate. The King lives a lonely life in Buckingham Palace, heartbroken and insulated from his people by his advisors and ministers. The idea the novel proposes is that with the King’s pro-peace, pro-appeasement or even pro-German position it would have encouraged the various groups that were working for a “negotiated peace” with Hitler during the years 1936-1939. Most of the novel is set during the period known as the Phoney War between the attack on Poland and subsequent British declaration of war, and the German attack in the West in May 1940. ……..but not of what hardly anybody called the psychology of appeasement, that irrepressible urge to give someone something that it was pretty clear he ought not to have. The main plot line features young attractive Cynthia Fitzpatrick, whose family lives in Ceylon, along with other expatriate families administering the Empire. A sexual encounter with a rather unpleasant young man Henry Bannister is followed on their journey back by the fumbling Henry crashing the car into a tree. Henry’s death and the world situation mean that the Bannisters, even more unpleasant than their late son, and Cynthia’s parents return to England. Cynthia gets a position with the literary magazine, Duration, and begins a relationship with a brash American cipher clerk at their Embassy called Tyler Kent, who had previously escorted the weird Hermione Bannister around town. On her visits to the Bannister country house, Ashburton Grange, meetings in London, and Tyler Kent’s rooms Cynthia discovers that these people are part of a “peace” faction of strident anti-Semites lead by an MP, Captain Ramsay, with a Miss Harris-Foster among their members. "I looked up her file. Do you know she joined the Imperial Fascist League as far back as 1929 when there were just half a dozen of them sitting in a room in Craven Street with Mussolini’s photograph on the wall? And somebody who had tea at her flat said she had an antimacassar with the words “Perish Judah’ embroidered on the back". At Duration magazine Cynthia meets up with fellow employee Anthea, a tall painfully thin girl of about twenty-four who reads the Daily Worker and has a friend Norman working in a cloak-and-dagger outfit. Journalist Beverly Nichols, who moves warily among the peace faction, meets the King who is impressed by his articles. He is asked by the King to help him write his 1939 Christmas address to the Empire, an event that excites Captain Ramsay and his associates. This part of the narrative is in the form of a witty and bitchy diary in which Nichols amusingly frequently complains about the acquisitive behaviour of his young male friends. Some other sub-plots reinforce the atmosphere and mood of the class-ridden world of England in the 1930s, and 1940s. In my ignorance I had not heard of author D J Taylor, whose fiction books have been long listed for the Man Booker Prize, and who also writes non-fiction about the interwar and past war years. THE WINDSOR FACTION is one of those books I did not want to finish because I was enjoying it so much. It is such a clever blend of alternate history and faction that the reader might be confused as to which are the real life characters and which fictional creations. Of course Edward VIII, Beverly Nichols, the “sophisticated” American Tyler Kent, and the fanatical Nazi Captain Ramsay were real life characters. Another case where real people are more frighteningly insane than any fictional creations. Ramsay stated that Calvin’s real name was Cohen, and that Cromwell was an agent of the Jews. The main character Cynthia develops over the course of the book and turns out to be much more enterprising and determined than the reader expects. The plot is full of intriguing characters at Duration magazine, in the Intelligence services and in the Fascist groups and is scattered with anecdotes from the time. Despite the serious subject the author manages to provide some humour with a sharp witty dialogue. "Don’t do what Inkerman in B.2 did. He went away for a weekend with that woman he met at the Nordic League-the one who had a picture of Adolf in her bedroom-and there was the hell of a row". 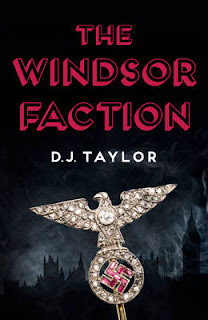 THE WINDSOR FACTION is an excellent read, blending plot, characters, and educational value into a fascinating and interesting novel that reinforces the idea that the Second World War was like the Battle of Waterloo “the nearest run thing you ever saw in your life”.